One of my goals for this year is to refine my inventory. I want to focus on items that are directly related to creating unique projects with fiber. That includes the material itself in different forms (combed top, roving, batts, locks, yarn, etc.) and tools necessary to help the process along. Eucalan, spindles, knitting notions, felting needles. These are all items that enhance the experience of working with natural fibers. 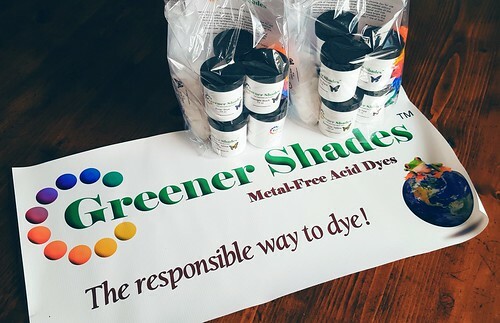 This spring I am very excited to add a new product to the line up: Greener Shades Heavy Metal-Free Acid Dyes from Still River Mill. I have been using these dyes myself for about five years, and while I am not an expert, I am happy to share them with you now! What will you find at my booth? Hard to believe, but this weekend is the Pittsburgh Knit & Crochet Festival! I had a lot of work to do to get ready for this show. 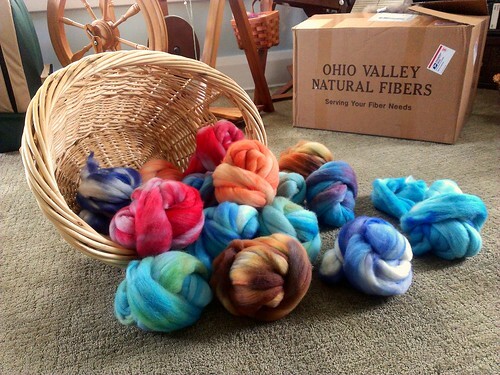 My last yarn & fiber event was in November and there was a lot of restocking to be done. In addition to all of my regular items, I also added some new things. Felting needles! Dyed mohair top! Fabric covered buttons! From the outside, it may not seem like much, but let me assure you, there is a great deal of work that goes into this. And I do it all alone. I dyed each fiber, spun each yarn, braided, picked, labeled, packaged, folded, measured, and washed each item on my own. All of these photos were taken since February 27. Every January our local SCA group hosts an evening of eating and dancing. To help pay for the site, we hold an auction. Usually the tables are piled with cast-off garb, feast gear, books, nicknacks, etc. We don’t generate a huge amount of money for those things. But one year there were several handmade items on the table, which helped to increase the money we made. For this year I suggested we do an artisans auction — all items donated must be made by hand and relevant to our group. My contribution is handspun yarn (surprise!). I have three skeins of Shetland. One is the natural fawn color and the other two constitute my first attempt at natural dyeing in many years. I started with three pots on the stove. One had alum, one had copper, and one had madder root. While the madder was simmering, I mordanted the yarn along with some fiber. I put one skein of yarn and a braid of roving in with the madder. In the alum pot, I dumped some turmeric and brazilwood. Since there was extra space in the pot I tossed in an old dish towel. After removing the yarn, I dyed a piece of linen fabric. The copper pot got logwood extract and then later I threw in some tin. Nothing exploded and I didn’t pass out, so I think it was okay. The yarn dyed the best, but what a mess! I rinsed the skeins so many times and still it seemed like the water wouldn’t run clear. 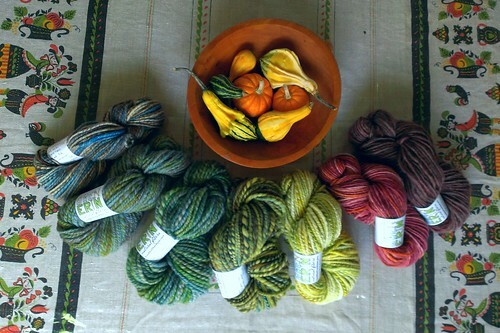 And despite straining, I ended up with all these fine pieces of plant matter in the yarn. When I reskeined them, I ended up with a dust pile underneath the swift. But overall they turned out better than I had expected. And you cannot deny the power of natural light in photos! 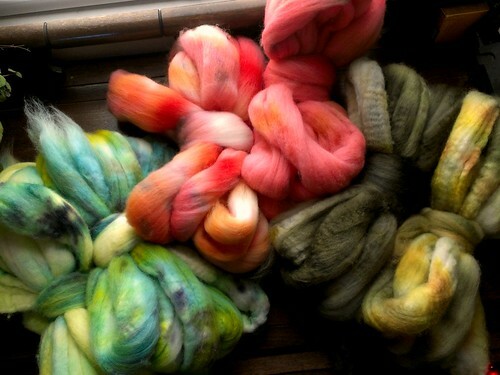 Can’t say I have much experience dyeing silk and what few encounters I have had with it have been awkward. Mostly I’ve tried to dye silk noils. The little puff balls sit on top of the water and refuse to take up the dye. I know I ought to soak it first, but I just don’t. Add it to my list of personal failings. So when I decided I wanted to dye silk scarves, I can’t say for sure where the notion came from. Part of it was just that I’ve been seeing so many dyed fabrics lately. Dyed fabric has such a different look than dyed fiber. And I knew I wouldn’t have to buy different dyes. Plus I needed a change. So I went to Dharma Trading and started looking at their wide variety of dyeables. Oh! But even better! I remembered that my dad had abandoned a box of silk scarves at our house some months ago. He hadn’t thought about them for this long, so why not go ahead and use them? As I opened the packages, I was delighted to find six. There were three small squares and three of varying large sizes. Since I had experience dyeing fabric and protein fibers, I figured I didn’t need to read any directions. Just go for it, right? I tied them up and left them in a pot of acid water to soak. When I was ready to dye them, I squeezed out the excess water, laid the bunched up scarves in a glass baking dish, and squirted the various colors around. Then I baked them for about 30 minutes. When they came out, I rinsed them in water before hanging them to dry. With the sun and breeze yesterday, it took just minutes! I’ll probably give them a proper Eucalan bath later. I’ll admit, I got distracted. 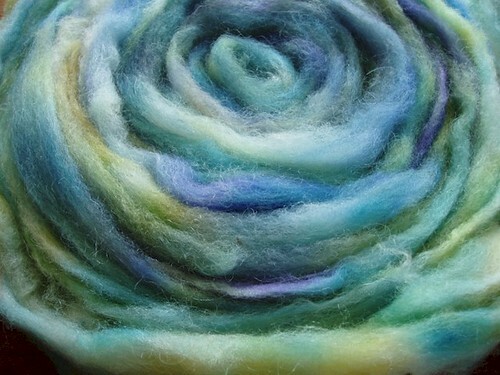 Playing with something new was much more exciting than dyeing yet more roving. I happily abandoned my pots on the stove to admire the scarves as they blew in the breeze. What am I going to do with these? Who cares? Everyone is getting a silk scarf for Christmas. Whenever I get a new idea for something, I just assume that it appeared in my head because someone else has already done it. The fear of copying keeps me from doing many things. However, I know that almost nothing we do is truly original. Should I just blaze on ahead, regardless of what may already exist in the universe? Anyway… my latest idea came Thursday while I was trying to squeeze in some dyeing. Since the Pittsburgh Knit & Crochet Festival was more successful than I had anticipated, I am now scrambling to get more inventory ready before A Knitter’s Fantasy. Rather than dyeing for three days, I just did as much as I could in one. Along with my usual crock pots and stock pots, I also had two roasting pans in service. Usually I lay out 8 ounces and dye it all the same. Then I have two 4-ounce braids that match. This time, instead of laying them side by side, I laid one on top of the other. When they came out they weren’t the same, but they did go together nicely. And that’s when I thought, “aha! Companion colors!” You would get 8 ounces total, but you could spin them as separate yarns, ply them together, alternate, etc. One is semi-solid and the other has more variety. I’m sure no one actually wants this, but I’ve got a few to try out and then I’ll probably keep doing it anyway (because I just do whatever I want most of the time). Even if the customers don’t care for it, I may enjoy using them myself. Or I could split them up and sell them separately. Basically it’s very low risk to try something new-ish. Why not, right? And by “studio” I mean my kitchen. Over the past two years I’ve gotten myself into quite a rhythm. On average I get out my dyeing and carding equipment once a month. I spend one week dyeing and the next week carding. That usually leaves me one week to get everything labeled and packed to go to my next show. When it comes to dyeing, I still don’t have any recipes. I tried to do color cards, but when I went back to repeat those colors, they came out differently. Oh well. That means I’ll just keep doing what I’m doing and not worry about it too much. One of a kind (sort of) it is! By the way, I just found out that this “OOAK” thing everyone uses to describe their work stands for “one of a kind”. Huh! Anyway, I can’t go beyond three days of dyeing otherwise I get so bored and mentally dried up that I just pour black on everything and walk away. Day three is usually my least productive day, however this week it was my most productive. On Wednesday I had a haircut at noon, so I couldn’t get started until after that. And the first day I usually get started late because I have to get out all the pots and dyes. With two crock pots, three stock pots, and two roasting pans, I was able to get all of that and a little more done in two afternoons and one day. Today I have the pleasure of cleaning up the kitchen. But the living room also needs to be vacuumed, so I think it will just end up being a full on cleaning day while I wait for the fiber to dry. Or at the very least, turning white fiber into colorful fiber. It feels like I’ve been spinning more in the past three weeks than I have all year. Totaled up, I got 10 new skeins done. Some have already found new homes, but I’m going to keep at it this week because I’m not quite done yet. 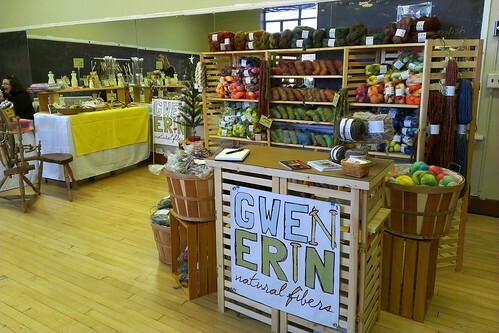 This past weekend I went to Pittsburgh for Indie Knit & Spin and it was a fantastic day. When the right people are there, ready to shop, enthusiastic, and knowledgeable, it just doesn’t get any better. I sold the Country Craftsman spinning wheel, so now my living room is a bit more spacious (just in time for Christmas!). The totes and bags I just filled with fiber are already empty again, so I see plenty of dyeing in my future, although that can wait until January! Even though I am done for the year with fiber festivals, I have one more event to attend. I am participating in a local art/craft show this weekend. Many of the other vendors are friends from my days in college, so it will be nice to be “back home” this holiday season. For this event I will need primarily finished goods, but I’m going to bring yarn and a bit of fiber to help fill in the space. I’ve been trying to get as much knitting done as possible, but I always wait until the last minute. And where I should have 50 pairs of fingerless mitts done, I only have 12. My goal is 15, so this week I will be doing a lot of frantic knitting, some felting, a bit of carding, and some spinning. After all the hubbub dies down, I swear I’m going to start crocheting more. I bought those two books from Knit Picks and I just haven’t had the time to really sit down and work with them. My December and January are clear right now, so I’m looking forward to taking a breather, washing my fleeces, conducting some experiments, and learning a few new things. Sadly, when you are in production mode, you don’t always have the time to explore. But if you don’t, then your work can get dull. It’s a delicate balance. As a regular reader of this blog would know, I enjoy taking trips down memory lane now and then. Having a Flickr account since October 2006 (hey – seven years this month!) gives me the chance to compare earlier work to my current work. I can see how much I’ve improved — or stagnated. I can see how much more — or less — productive I am now. Either way, it’s good to remind myself of my progress. 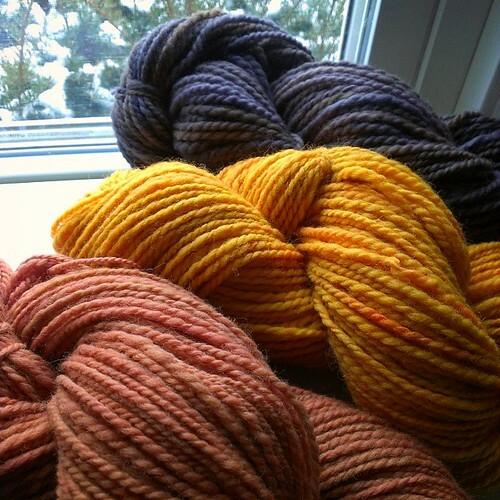 Today I am taking a look back at my early dyeing experiences. I am sure that I had started dyeing earlier than what is available via Flickr, but I hadn’t started documenting things yet. 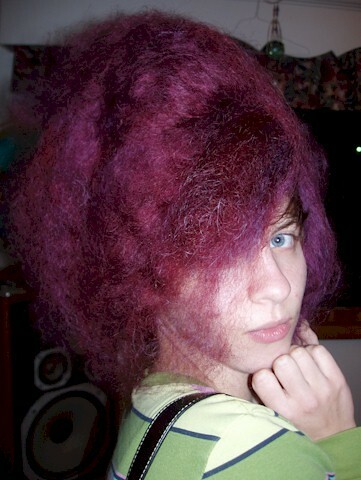 The first photo I have of dyed locks is this one from November 6, 2006. It was Lincoln wool. I had run them through the carder and decided it looked like a potential wig… so it went on my head! The next two photos are from the following spring. The first from March 9, 2007 is combed top, just a domestic wool blend. 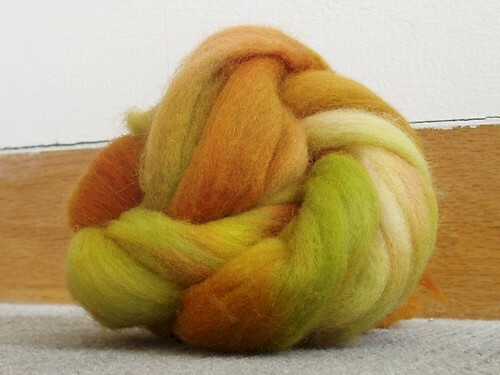 When I first got into dyeing, I would buy a pound of domestic (super cheap!) and dye 2 ounces at a time to make it last longer. Now I am buying 22 pounds at a time. What a difference. Those colors say lanaset to me, so at that point I was already getting past the Kool-aid/Wiltons phase and into wool dyes. This photo is from March 11, 2007. 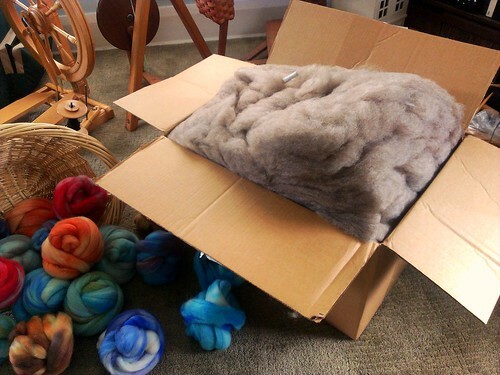 It’s the wool roving I received from a fiber processing mill that lost my original fleece. To this day I am not entirely sure what the breed was, but I think I still have some of it lying around. It wasn’t the greatest stuff, but it gave me a lot of experience dyeing. I think it’s safe to say I should be out of my “experimental” phase by now. Sure, it’s fun to try new things now and then. Different techniques, fibers, dyes, etc. One doesn’t want to get bored. However, I have been avoiding something that almost every dyer I know can do: repeated colors. I have always claimed that I take an “unscientific approach” and I don’t record any recipes. It ruins the artistic flow. And that is true, but also I am using it as an excuse to remain casual and detached, a way to avoid being purposeful. On one hand, having repeatable colors would make my life easier in many ways. On the other hand, it could be boring. Why not do… BOTH!? Someone (Rich first and then my dad) suggested that I have two separate collections: those that are predictable, repeatable colors, and those that are special little moments in time that will never be seen again. I’m sure many dyers take this approach, but it makes a lot of sense. I can still have the fun of “come what may”, but those shoppers who want a sweater’s worth in one color can get it. We’ll see if I can pull it off! So… what’s been happening lately? I had to go through my inventory. After Woolfest, I knew that I’d have a lot of purchasing to do before the fall festival season started. The most important item I needed to restock was my fiber. I’ve only got a few bags of dyed locks left and not many batts. But the starting place for that is the raw fiber itself. I put in an order with Ashland Bay and ended up with three 22 pound bumps. One is Falkland, one is Blue-faced Leicester, and the other is their “Colonial” which is a Corriedale-type wool. The last I planned on using primarily for batt base wool. 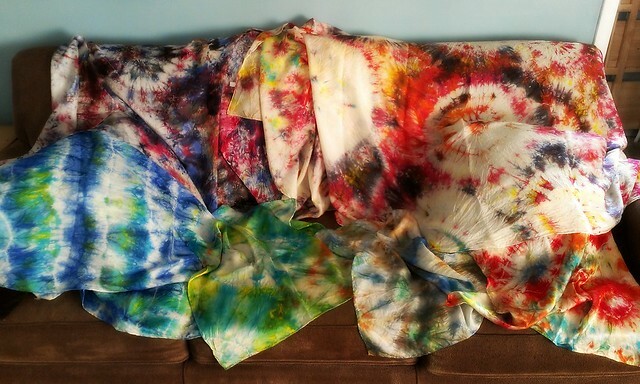 I started dyeing some of it this week. Oddly enough, just after I received the combed top from Ashland Bay, I also got word from the two processing mills where I had fleeces. 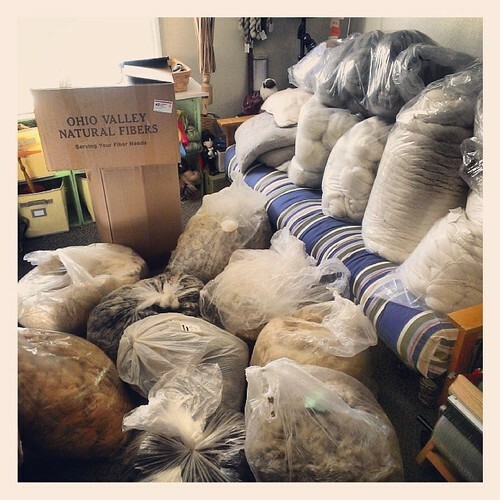 First Ohio Valley Natural Fibers sent me an invoice. Two days later I got a call from Zeilinger’s that I had two fleeces ready for shipment from them. OVNF sent theirs Priority, so it showed up yesterday. I’ve also got a new event on the schedule for next month. After being invited for several years and never having that weekend available, I am finally participating in the Grey to Green Festival at Wick Park in Youngstown, Ohio. If you are in the area on September 21, come by for a visit.